September's update brings you a very interesting story about the acquisition of a 'pear shaped' Buchschmid and Gretaux Wood Inlay Company's 'Four Season' table. The routes taken and the time period involved in obtaining one of these very fine tables makes fascinating reading. Scroll down the page and absorb yourself in a wonderfully interesting story. Our September update brings you a very interesting story concerning the wonderful Buchschmid and Gretaux 'Four Seasons' series of coffee tables. These tables were produced in rectangular, kidney and pear shapes. The high level of workmanship required in hand building these tables meant that the production quantities of these pieces would inevitably be limited. We do not have accurate records of exactly how many were produced, but we don't think it amounted to too many - probably just a few tens of units. Unfortunately due to the nature of the Buchschmid and Gretaux Wood Inlay Company being primarily in the form of a cottage industry, accurate company records do not seem to have survived. This may have been due to variable, or at sometimes possibly even unrecorded entries, being logged as company output. Otto Chlup told us that the paper work was a little variable, especially in the recording of the exact production figures. So, an educated guess based on what we know of the Buchschmid and Gretaux working methods should allow us to construct a reasonably correct judgement of the output of certain specialised pieces. As the veneer packs were cut at multiples of ten per pack, then it transpires that a max of ten pieces could be built at one production line 'run'. How many of those 'production runs' were made for the 'Four Seasons' tables is debatable, but we don't think there were too many, probably no more than three or four - but it may have even been less than that! To be honest, we only know of less than ten pieces ourselves, although there could of course be a fair few more of these out there. 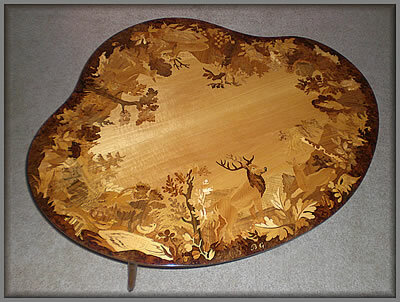 If you do happen to own a 'Four Seasons' table yourself, why not get in touch and let us know about it, it would be nice to know how many do still exist. We have owned a B & G kidney shaped coffee table since about 1963 and over the years always wondered about its origin. We often on travels including one trip to Germany looked for similar work but never saw anything that depicted the artistry of animals in inlay. My sister and her husband, a career Army person, who now live in San Antonio, Texas, also have one of these tables which they purchased about 1958 or 1959 and they in turn purchased ours for us in 1963. My brother-in-law served in Germany in WWII and in fact was a prisoner of the Germans just before the war ended. He was one of the few career service people that were permitted to be reassigned back to Germany after the war since he was one of the highest level non-commissioned officers in the Army. He returned to Germany on three occasions, 1950-1953, 1956-1959 and 1962-1963. On his second tour he was assigned to the Third Armored Division Headquarters near Frankfurt. He said one day a person came into the building with a beautiful kidney shaped inlayed coffee table and inquired if he wanted to buy it. He liked it very much and bought it for about $100.00. When they came back to the USA in 1959 they had the table with their furniture. Three years later in 1962 he was assigned again to Germany, This time in the Munich area. They left the coffee table with us to care for. We liked it so much that we asked them to try to get one for us while back in Germany. Sometime later they informed us that they had been looking everywhere without success. They had finally been to a market at or near the Army Base and a gentleman told them that they had quit making the special kidney shaped tables with the intricate design because they were too time consuming for the price they were able to get. However my brother-in-law gave him his address and asked him if he found a table later to please contact him. Sometime later, in 1963, just before they were reassigned back to the USA he said this person at the market showed up at his door with one of the tables. He told my brother-in-law that he understood it was the last one available and was the Company’s plant or office table they kept for display. Of course we never knew his name nor the accuracy of his story but the table was purchased for $125.00 and sent home to us. We have kept it over the years with a plate glass protective cover and it is in excellent condition today. The above picture (top of this page) is of our table and I find the design almost identical to that of the Valery table, within the usual artistic variances of veneer color and grain that might occur. Please note that we (The Marquetry Society) are unable to give market reference valuations on any marquetry, or wood inlay works, or pieces of any kind. Any such value information as we do give on this web site has been derived from references to published information made available by the appropriate auction houses. If you wish to obtain an accurate valuation for your wood inlay or marquetry piece/s, we would recommend you approach a relevant auction house for an up to date and accurate current valuation assessment. Click the above button to return to page 42 of "Can You Help"
or, if that is not possible, then just type it in as seen above, thanks.